Chef Alessandro Persico was stirring up some burrida di pesce piccante; the most wonderful aromas emanated from his cooking pot. His worktop was a riot of Mediterranean ingredients and colours. 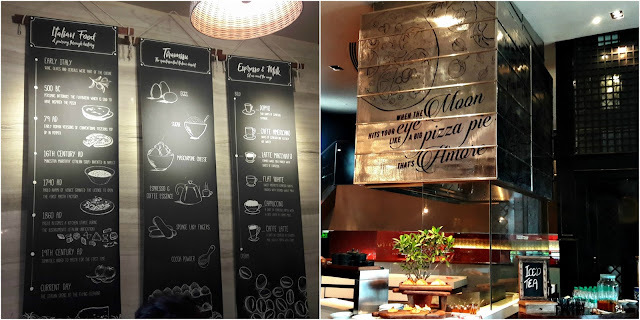 The Flying Elephant at Park Hyatt Chennai has a new kitchen, The Italian. Chef Alessandro Persico, Chef de Cuisine from the Grand Hyatt Mumbai has come with his favourite recipes to give Chennai diners a taste of his treasured specialities. And we were the lucky ones who were going to learn how to make some of those fabulous dishes. Of course, all these dishes will now be on the restaurant's menu. The Flying Elephant has undergone a makeover of sorts, The Italian now has its own entrance in the spiral restaurant. Wall sketches take you through the evolution of Italian food and I swear there's even a recipe for tiramisu if you look closely enough! 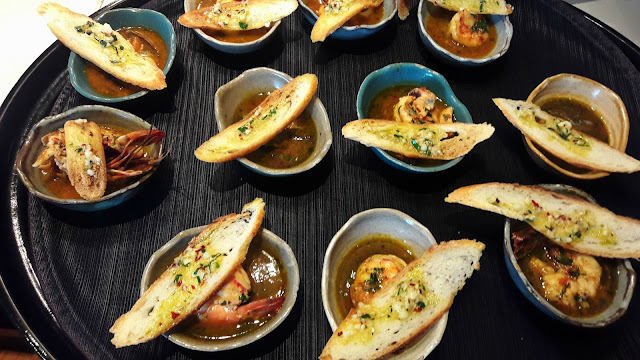 Burrida di pesce piccante, a spicy seafood soup had the marvellous flavour of roasted lobster shells, garlic and was chock full of prawns, squid, octopus and fish. The baguette slice it was served with was colourful, zesty and unabashedly garlicky. Beetroot ravioli stuffed with goat's cheese - ravioli di barbabietola e caprino al profumo di tartufo was next on the agenda. Who would imagine that the humble beetroot could be made into ravioli. And the colour - the deepest red that only Mother Nature can produce. 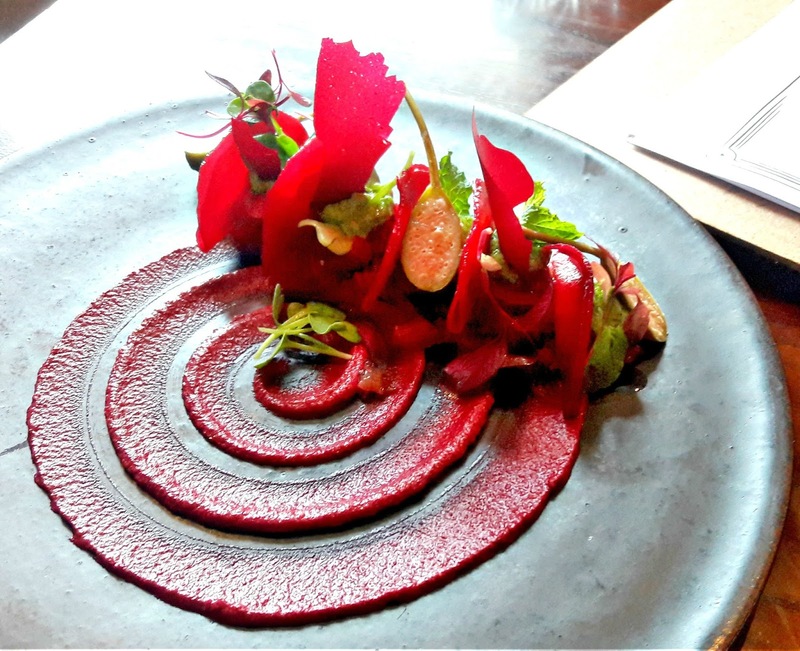 Chef Alessandro had boiled the beetroot earlier, he showed us how to slice it and fill it with a goat cheese-truffle oil stuffing. He also made salsa verde, telling us that he does not measure any of the ingredients for the salsa, rather he checks the taste and colour and knows if it's ok (that's experience for you)! 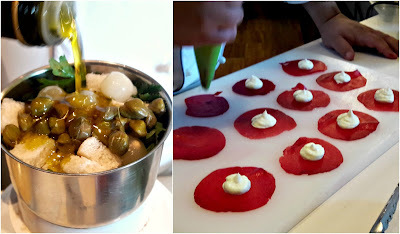 He showed us his quick version of plating it and in a couple of minutes, with salsa verde and capers acting as bookends, a rustic yet elegant presentation of beetroot ravioli was ready. It tasted stunning! 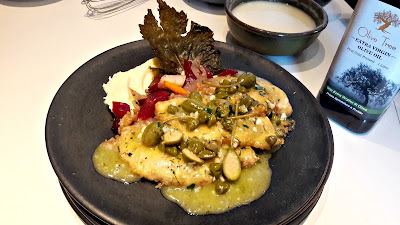 Scaloppine di pollp alla francese - pan-fried chicken scaloppini with caper sauce and root vegetables was the main course. Chef Vamsi, who is now heading The Italian, sliced the chicken breasts thinly, dredged them with flour and pan fried them. In another pot, cream was added to mashed potatoes and in a third pan, root vegetables were being sauteed. Multitasking or what? Small plates were sent around for us to taste. The chicken was deliciously tender and sat on a pillow-soft bed of mashed potatoes. A gorgeous sauce made with capers, herbs and clarified butter was drizzled over and a dried vine leaf provided the finishing master-touch. Any good Italian meal ends with dolci. 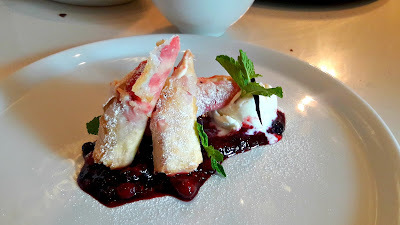 We learnt to make a tongue-twisting torta al formaggio dorata con salsa al sottobosco - deep-fried cheesecake with berry compote and ice cream. The cheesecake mix was piped on phyllo pastry sheets, rolled up and deep-fried. The dessert tasted spectacular, the berry compote cut through the sweetness and all our resolve and we indulged in that spectacular dessert. Calories? What calories?? If you would like to be informed of these workshops, do call and register at 044 4991 9965/044 49919961.